A month has passed since I returned to "Earth" from my FMARS adventure on Devon Island. I feel I now have sufficient perspective to reflect upon the experience. This post will summarize my impressions, lessons learned, and recommendations for the future. 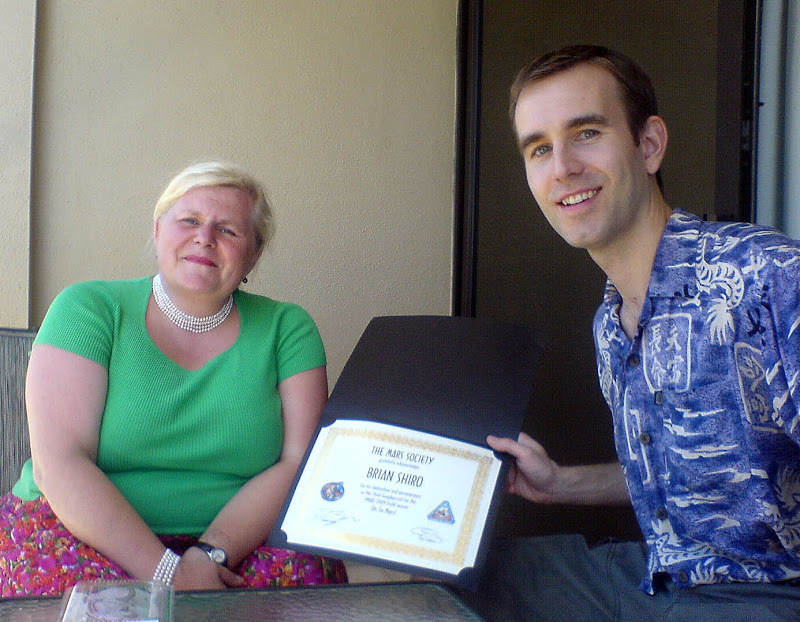 I am very grateful to The Mars Society for choosing me as a crewmember on this expedition. Taking part in the mission was an honor and privilege, and I hope this experience can lead to other opportunities in the future. I encourage readers to review my previous FMARS posts. To make finding the FMARS-related content easier, I've aggregated all of it on the "fmars" link on the upper right corner of this website. If you prefer to remember a short version of this page's URL, just point your browsers to http://tinyurl.com/BrianFMARS. Here you can find my blog posts, YouTube videos, and media stories mentioning me. This post is rather long, so the navigation links below can take you directly to each section. Although I enjoyed the mission tremendously, it felt really good to come home and see my family. I've gone on extended trips in years past, but this is the first time I've been away for so long since becoming a father. It was hard being apart from my 20-month-old son, but luckily we could chat on Skype before and after the simulation periods of the expedition. The photo shows him talking to me during one of these video calls. My wife was really good about posting lots of pictures and videos of him that I could see throughout my time away. While I was gone, he grew up considerably, and his language skills really blossomed. He was a little quiet around me at first when me met in the airport, but he remembered me and before too long we were back to playing together like no time had passed. I was concerned that my beard might confuse him, but he didn't seem to mind. The FMARS-XII mission was a resounding success. Despite setbacks that cumulatively cut our simulation period in half, we achieved all of our major mission goals. 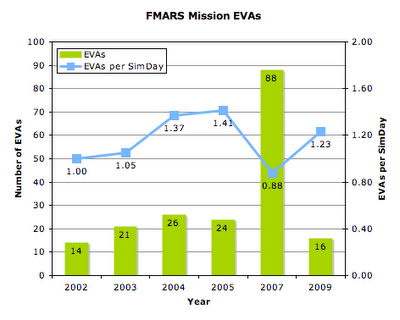 Compared to previous FMARS missions, we held our own in terms of EVAs completed per day (1.23), but our percentage of simulation days was much lower than other FMARS expeditions at only 50% (13 sim and 13 out of sim). This means half of our time was spent out of sim. In the chart below, note how the trend over time has been a gradual decrease in the percentage of simulation days from 82% in 2002 to 50% in 2009. Could this be evidence that the Mars Society may be getting less efficient with its operation of FMARS since it cut its ties to HMP? 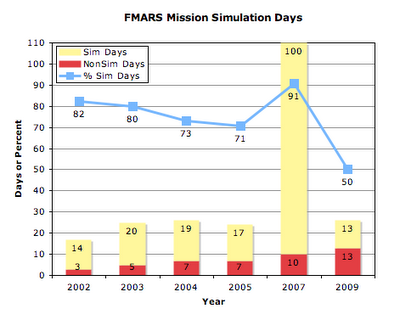 The high sim- to non-sim ratio in 2009 was due to a lack of preparation as a consequence of the short lead time for the mission. We had only two months to plan the expedition from the time of our selection to boarding the planes for Resolute Bay! That means we had very little time to find sponsors, raise funding, establish a research program, and solicit equipment donors. We missed out on several would-be opportunities due to the short time frame. It also severely limited our time for mission planning and crew training prior to going to the Arctic. All we had time for were a few of conference calls and a 2-day meeting in Denver just two weeks before the mission. Once we got to FMARS, we were kept very busy accomplishing a number of projects to improve the environmental compliance of the station, and this took valuable time away from the research part of the mission. Lessons Learned: Select crews with more notice - at least six months minimum but preferably one year. This will give them more time to plan a proper mission and hit the ground running when the arrive. Send an advance engineering team to FMARS prior to the main crew to get the Hab ready for the field season. Consider having the engineer remain at FMARS throughout the field season out-of-sim to handle Hab maintenance so the crew can have a higher fidelity simulation. Officially, the FMARS simulation is supposed to come as close to approximating conditions on a real Mars mission as possible. This means no going outside without wearing a protective spacesuit . We did observe this rule as much as was feasible, but the realities of our engineering systems forced us to break it more often than I would have preferred. This meant we had to frequently break sim for basic Hab maintenance tasks like fueling the generator (every 8 hours), getting water (every 2-3 days), and burning trash (about once per week). I also didn't don a suit to raise the Mars flag for safety reasons. One of the biggest time sinks during the first half of the expedition (for Joe, at least) was fixing our ailing ATV rovers. They kept breaking down. After much trial and error, Joe eventually discovered that the carburetors needed to be completely disassembled, cleaned, and re-built. Amazingly, he was able to do this MacGuyver-style with the available materials we had at the Hab. The photo shows Joe reading the ATV manual on his laptop with a partially disassembled vehicle behind him. If explorers on a real Mars mission have vehicles like these, they'll of course have to either fix them while wearing a suit or bring the vehicle inside some kind of pressurized garage where they can work comfortably. We had no garage available, so the repairs had to be done in the open. Repairing them in a spacesuit would have taken much longer, and given how valuable our time was, the decision to do ATV work out-of-sim was probably a good one. As far as I can tell, this was the first FMARS expedition not to have a research project on the social-psychological issues associated with a small crew confined to the Hab during an extended mission. There just wasn't time to get a project set up in time, and even if we had, I question whether we would have had time to fill out lengthy surveys every day. With our simulation compressed to only 13 days, we were working overtime to squeeze in all of our other research projects. It's a shame that this had to be the case because an opportunity was missed to gather valuable human factors data to continue work carried out in previous field seasons. Lessons Learned: The Mars Society needs to have all new ATVs. Either buy them or get them donated. Get fuel-injected ones so that carburetors aren't an issue. Consider building a garage where the ATVs can winter over; this can also double as much-needed storage space. Try to avoid ever dropping the psycho-social component of FMARS research in the future. This was the first expedition during which I blogged from the field. Overall I am happy with the content I created, but I must admit that it wasn't easy. I was always exhausted from working 12-16 hour days filled with manual labor, and some nights I just didn't have the mental energy left to focus on writing blog posts. The same thing applies to the crew in general, as we were all pretty reluctant to write daily reports. I don't think boredom will be a problem on Mars missions, but overwork may be. Nearly all of my planned blog posts eventually saw the light of day in one form or another, but sometimes the delays in posting them were longer than ideal. This resulted in fewer but longer posts rather than more frequent shorter ones. The 10-day hiatus in my posting from July 20-30 had a profound effect on blog readership (see image of site visitors per day below). Prior to that, the daily pageviews numbered in the 150-300 range, but after my Postcard from Mars post, there was a precipitous drop in pageviews that never recovered even after I filled in the missing posts and added subsequent ones later. I don't think that post itself scared anyone away, but the long delay between that post and the next must have led to loss of interest in the readers. Another first for me was producing video blog posts and sharing them on the FMARS YouTube Channel. I used iMovie to edit the videos, which grew in sophistication over time as I learned more tricks with the software. One thing I learned about myself in editing the footage is that I tend to tilt my head to the right most of the time and sometimes talk with a bit of a lisp. I had to be mindful of these quirks and try to correct for them. I wonder if I've always been this way or just developed those habits in recent years. One interesting debate we had prior to leaving for the Arctic was whether we'd be allowed to directly interact with social network services or if Mission Support would serve as an intermediary. There were strong cases presented on both sides of the issue. In a real mission most communication would likely be censored by Mission Support, but in this case we opted to allow crewmembers direct access to social networking since outreach was a high priority of our endeavor. We'll be presenting a paper at the upcoming AGU meeting on this topic. 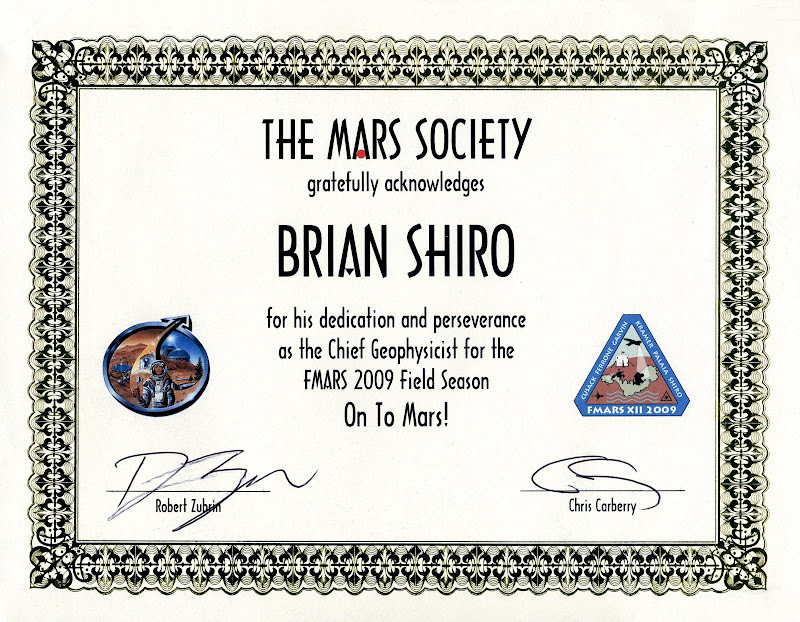 Throughout the mission, I managed to post daily twitter updates to the @FMARS2009Crew and @brianshiro accounts. Some of my tweets even made it to the "Today's Interesting Tweets" post on NASAWatch (1, 2, 3, 4, 5, 6, 7, 8, 9). My fellow FMARS crewmembers and I were also very active on Facebook throughout the mission. Lesson Learned: Once you have readers' attention, avoid actions (or inactions) that will lose it. Living in the Flashline Mars Arctic Research Station was quite comfortable. Sure, we had to cart in our own water, bag our poop, burn our trash, and eat no fresh food, but I liked living there. It's a great place to test crews for long duration space missions. The Hab may seem cramped by some standards, but I've always been a claustrophillic person, so I didn't have a problem with it. The photo here shows my stateroom. Note how my bunk is on the floor, and the room next to mine has its bunk directly above mine. This nesting of the room spaces is what allowed FMARS builders to incorporate six separate staterooms into the design. It was nice having a space of my own where I could retreat when I needed to be alone. Having personal space is important for a crew on a long duration mission. I only wish the walls between the rooms had better insulation because everyone could hear every sound that anyone made. This affected the sleep of at least one crewmember, who actually got pretty sick due the lack of rest. We ate well at FMARS. Those of us who were used to eating balanced diets of fresh foods had to adjust to eating mostly processed foods and more junk food than usual (like chips, Pop Tarts, etc.). When one is living in a cold climate and working as hard as we were, the body expends a lot of calories that must be replaced. Therefore, we ate a lot. We had a set rotation where we'd take turns with cooking, cleaning, and generator duty. However, one crewmember (Kristine) loved cooking and baking so much she ended up taking on that duty more than the rest of us. There was never a shortage of desserts or creative meals each day thanks largely to her efforts. I appreciated the pancakes Kristine made for me on my birthday. Plus, Vernon's wife had supplied Vernon with a number of recipes and ingredients for meals that really hit the spot. My only regret is that our breadmaker died after we baked the first loaf, so we didn't have bread for most of the mission. Despite my video blog post on exercise at FMARS, we didn't have or make much time to work out. I only did it a few times, which was the most of any other crewmember. Granted, conducting EVAs and improving the Hab's infrastructure were great workouts themselves, but that doesn't count as cardiovascular exercise or targeted strength training in my book. I definitely felt the effects of physical deconditioning in my body when I returned home, much like real astronauts do when they come back from a space mission. I've been working this past month on regaining my previous stamina levels. As a crew, all six of us got along very well, despite hardly knowing each other prior to the expedition. Of course, we had differences of opinion or stressful days that led to some arguments, but the hard feelings never lasted too long. I think on a longer mission some of these issues could have been more problematic, but for only a month it was okay. For example, one point of contention was over the shower. We had agreed up front only to take one shower per person per week. However, one crewmember felt this interval was too long and took more frequent showers, which upset some people. The significant generational gap between our commander Vernon (68) and the rest of us (26-39) was the source of some friction too, but we always managed to iron out our problems in the morning crew meetings. Lessons Learned: Crew selection matters, but you can get by with some incompatibilities for short missions of a month or less. Personal space and respect for others' quiet time are important. Try to enforce some kind of crew exercise regime. Bring a breadmaker. I've said it before, but I'l say it again. EVAs are fun! No matter how physically tiring an EVA got, I couldn't wipe a silly grin off my face from all of the fun I was having. On the first couple of EVAs, I had a spring in my step as if I was actually walking in a reduced gravity environment. The picture here shows the girls striking a Charlie's Angels pose. The aspect of our EVA operations of which I am most proud is the role I played in our traverse mapping and photo geotagging. You can read all about it in a previous blog post. I think wearing a GPS watch and heart rate monitor should become standard practice for all future EVAs. An EVA wouldn't be an EVA without the spacesuit. These are impressive garments made by Mars Society volunteers. Of course, they're not real spacesuits in that they're not pressurized and don't provide any protection from the space environment. However, they do simulate the bulk and weight of a real spacesuit, so working in them does approximate the work a real astronaut must do. The gloves make doing any work requiring fine dexterity a significant challenge, but we quickly learned to mitigate this by taping plastic zip ties to our fingertips so we could punch buttons more easily. Using an implement like a pen or rock also helped. At the start of the mission, we tried on all of the suits to find one that fit each crewmember best. This wasn't straightforward since the sizes were very odd - generally with very long torsos and short limbs. Joe, Kristine, and Stacy sewed suspenders inside all of the suits, and this was a most welcome remedy to the long torso problem, although it did tend to exacerbate the short leg problem. Midway through the mission, I switched suits with Christy since my skin kept getting exposed every time I would extend my arms in the first suit. Future space explorers will likely have custom suits to fit them like the astronauts do now. This could be achieved by making the suits in modular sections so that arms, legs, and torsos can be lengthened or shortened by adding or removing sections. One aspect of the EVA simulation was waiting in the Hab "airlock" for 2 minutes before and after the EVA to simulate the de-/re-pressurization. In a real case, this would likely be longer. The airlock is a small, round room that can barely fit four suited astronauts. I wished the inner door had a window on it and that the walls had something posted on them we could read. 2 minutes can seem like a long time just staring at a blank wall. The water delivery and communication systems we used with the spacesuits left much to be desired and must be re-thought. The Camelbak pouches we used should have worked fine, but the bite valve was in a L-shaped elbow. This made it very difficult to fish through the hole in the helmet into a position that we could reach with our mouths. The Motorola radios and throat microphones we used for communications barely lasted for the duration of the mission. By the end, I think we only had a couple of working sets left. They did not hold up well at all. For the last two EVAs, I relied more on hand gestures than the radios. I've already mentioned the ATV problems, so I won't belabor the point here. Unlike the previous FMARS crew, we didn't feel particularly unsafe riding them wearing our spacesuit helmets. We did have to put adhesive weatherstripping foam on the insides of our helmets near our chins so that when we bumped along the trails, the bouncing helmet didn't hurt us. Perhaps future iterations of the helmet design can integrate more substantial padding into them to better account for both safety and comfort. Lessons Learned: At least one person on each EVA should wear a GPS Heart Rate Monitor watch and carry a GPS-enabled camera. Get new radios and microphones that will last and Camelbaks with a bite valve geometry that works better. Avoid EVAs in the rain. Without going into the long history between FMARS and HMP, I'll just cut to the chase. It's ridiculous that the groups do not work together in concert. HMP and FMARS are both focused on advancing human space exploration by testing technologies and procedures future astronauts may use. To outsiders, they are one in the same, and even when one explains that they are in fact distinct organizations, most people just don't get it. FMARS was originally Pascal Lee's idea (director of HMP), and it was largely due to his support that FMARS was built in the first place. 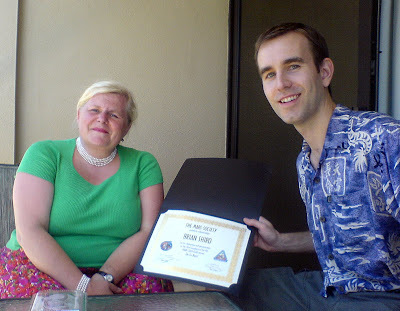 Regrettably, a falling out between him and Robert Zubrin (director of The Mars Society) led to the current situation with complete separation between the programs. 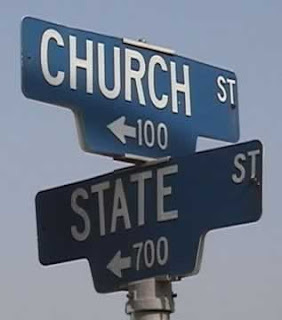 The rift between the two camps on Devon Island has been likened to the separation of church and state. After all, HMP is funded with state money from NASA and CSA, but FMARS sustains itself with volunteer donations from people committed to a future in which humans colonize Mars. In some ways, this is an apt analogy, but I think the premise that things have to be this way is false. There is no fundamental reason why the two groups should remain so completely distinct. In particular, I think the FMARS program suffers lack of resources and credibility due to its severance from NASA/CSA via HMP. The forced separation of logistical support for the programs and occasional duplication of research projects introduces a regrettable degree of inefficiency to both programs. Just this year, we missed two opportunities for synergistic research projects due to this artificial wall between FMARS and HMP. Everyone I met at HMP was very friendly and open. I really enjoyed touring the camp and learning about the exciting work being done there. The problem lies not with the participants of either FMARS or HMP but with their leaders Zubrin and Lee. I respect both of those men a great deal as visionary thinkers and scientists, but their leadership clash impedes cooperation. I doubt this meager blog post will affect a peace treaty, but someone had to get the issue out in the open. It might as well be me. Lesson Learned: HMP and FMARS should bury the hatchet and start working together again. Moving forward, I plan to continue my planetary mission training by possibly participating in future FMARS, MDRS, Spaceward Bound, or other similar activities. I think this will help me gain valuable experience learning how to conduct field science and live under simulated Mars or Moon conditions. I may even try to leverage the experience into a human space exploration focus for a renewed push to complete my Ph.D.
My FMARS work is far from over. I still have to analyze the data from my electromagnetic and seismic experiments. I plan to present it at several upcoming conferences and eventually publish it. I have no doubt that FMARS has helped me in my quest to become an astronaut, and I am proud to have contributed to a body of knowledge that will help humanity one day establish a permanent presence on Mars. 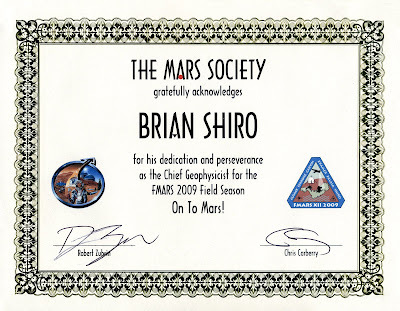 Remember, you can still help support the FMARS 2009 mission by contributing to my chipin fund for buying something from our Zazzle store. I'm glad I waited until I had some quality time to read through this without interruption. So many thoughts and impressions! First of all, awesome certificate! I liked the "lessons learned" in each section. In a big camera pullback, it's all these lessons that will make the real MARS possible. Also, nice Charlie's Angel pic! Hopefully, some future sims will have more "human factor" study, so they can start to evaluate some of the psychological effects, like Mars500. Very important. I do also hope that the two Mars programs come together again someday.